SEA had already completed several projects with LKM Recycling when they asked for our advice and support for exhibiting at a local event. The team set about thinking how we could make the most effective use out of the space and create materials that could be used again at different exhibitions and events. It was decided that a series of pull ups would give the flexibility required and various designs were created. 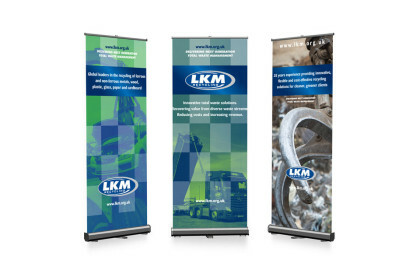 When creating an exhibition space, we always consider how visitors will be encouraged on to the stand and use the space. In order to achieve more interaction, we created an area to leave details for a free waste audit and displayed the different materials that LKM processes. As part of working on exhibition display materials with clients we discuss related aspects of the process, such as hand-out materials, PR, invitations and follow ups. This is all part of the holistic approach we have for each client campaign.